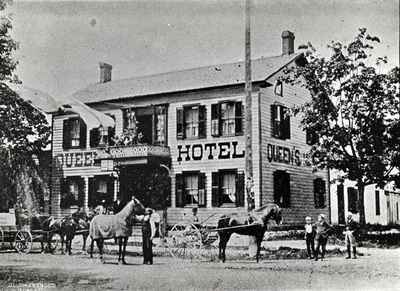 A house here was converted into a hotel about 1860, first known as the Victoria House and later the Queen's Hotel which closed circa 1900 and is shown here in 1897. In 1903, William A. Buckle purchased the frame building and applied a brick facing. Here he operated his meat market through the early decades of the 1900s. The present building at 235-239 Lakeshore Road East was built in the late 1940s and is home to RBC Dominion Securities. In 1831 a tavern was built on this site and became known as the Royal Exchange Hotel. 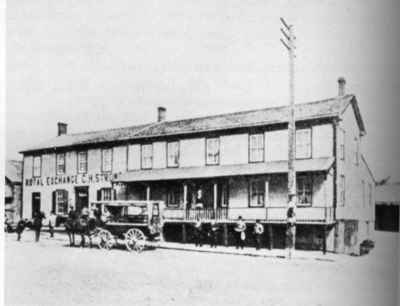 The hotel operated for many years and this view is from 1897. A large drive shed to house buggies and horses can be seen behind the building. The remains of the Royal Exchange Hotel were demolished in the 1930s and the fine stone building now on part of the site was built in 1937 as Oakville's fifth post office. From 1956 to 1967 it served as the public library. 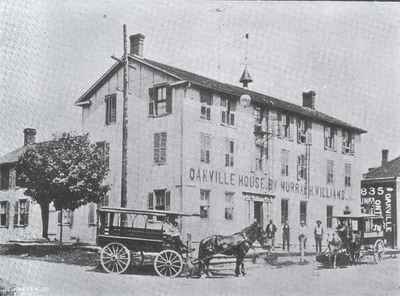 The Oakville House was built in 1827 as the first tavern and hotel in the new village. Built by William Chisholm, it had a long series of owners. This view is from 1897, and the original building was replaced in 1984 by the present replica. To counteract the drunkeness and bad behaviour in the Village, the Temperance Reformation Society was founded. 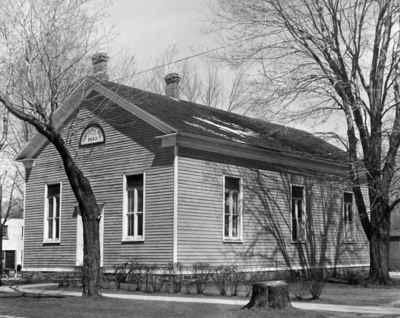 The Temperance Hall was built by Justus Williams and Thomas Leach and was the first erected for the Society's use. In the 1840s the hall was used for Methodist Church services, while in the 1850's it became a meeting place for Township Council. 1852 saw the Exhibitions of the Oakville Agricultural Association take place here. The Salvation Army used the location in the 1940s, and the building was demolished in 1970.